OBJECTIVES: The purpose of this study was to examine decade-long trends (2001-2011) in, and factors associated with, door-to-balloon time within 90 minutes of hospital presentation among patients hospitalized with ST-segment elevation myocardial infarction (STEMI) who received a primary percutaneous coronary intervention (PCI). METHODS: Residents of central Massachusetts hospitalized with STEMI who received a primary PCI at two major PCI-capable medical centers in central Massachusetts on a biennial basis between 2001 and 2011 comprised the study population (n=629). Multivariable regression analyses were used to examine factors associated with failing to receive a primary PCI within 90 minutes after emergency department (ED) arrival. RESULTS: The average age of this patient population was 61.9 years; 30.5% were women, and 91.7% were White. 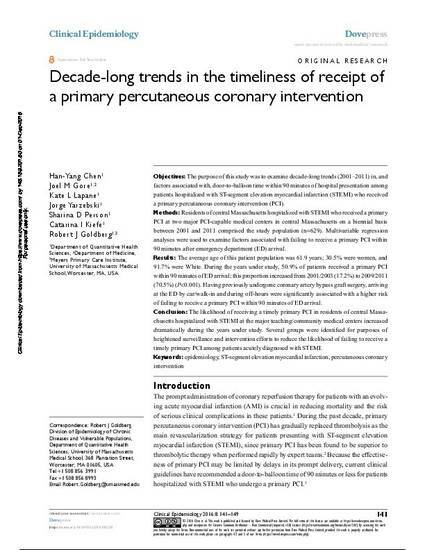 During the years under study, 50.9% of patients received a primary PCI within 90 minutes of ED arrival; this proportion increased from 2001/2003 (17.2%) to 2009/2011 (70.5%) (P < 0.001). Having previously undergone coronary artery bypass graft surgery, arriving at the ED by car/walk-in and during off-hours were significantly associated with a higher risk of failing to receive a primary PCI within 90 minutes of ED arrival. CONCLUSION: The likelihood of receiving a timely primary PCI in residents of central Massachusetts hospitalized with STEMI at the major teaching/community medical centers increased dramatically during the years under study. Several groups were identified for purposes of heightened surveillance and intervention efforts to reduce the likelihood of failing to receive a timely primary PCI among patients acutely diagnosed with STEMI.